Artist’s depiction of colliding neutron stars shredding spacetime, producing ripples of gravitational waves. Credit: NASA. David Reitze, executive director of the LIGO Laboratory, took the podium at the National Press Building in Washington, DC, this morning, and said the words we’ve all been waiting on tenterhooks to hear: “We have discovered gravitational waves.” And a packed auditorium in Caltech’s Cahill building in Pasadena—where people had gathered to watch the live feed—erupted into wild applause. Similar scenes were likely playing out at MIT, in Livingston, Louisiana, in Hanford, Washington, and in Europe, because LIGO is a $1 billion international collaboration with hundreds of scientists. And this moment has been 100 years in the making. Einstein predicted the existence of gravitational waves with his general theory of relativity in 1915, and physicists uncovered indirect evidence in the 1970s and 1980s. But direct detection has proven elusive—until now. And the story of gravitational waves and what they’re able to tell us is just now beginning. Here’s how it went down. On September 14, 2015, at 5:51 AM EST, the LIGO detectors at Livingston and Hanford both picked up signals within milliseconds of each other. The waveforms of those signals closely matched predictions of the simulations (see left). It’s like an audio fingerprint, akin to the decay signatures that high-energy physicists use to identify subatomic particles produced in collisions at the Large Hadron Collider. And it’s exactly what you would expect to find in your data if two black holes, about 30 solar masses each (that’s 30 times bigger than our own Sun), spiraled inward toward each other and merged in a massive collision event, sending powerful shock waves ripping across spacetime, some 1.3 billion years ago. It was so clean, in fact, that Reitze worried it was too good to be true. So did Alan Weinstein, who heads LIGO Caltech. After all, in the early operational phase of LIGO, project leaders had deliberately inserted false signals into the data to test the rigor of the analysis. Even though his colleagues assured him that this new signal was not a so-called “blind injection” exercise, Weinstein couldn’t quite believe it. He wondered if it was the work of a disgruntled member of the LIGO team injecting a false signal into the data as revenge. From just that one signal alone, physicists could infer the masses of both black holes by studying the frequency (one was 29 solar masses, the other 36 solar masses). After the merger, the newly formed black hole was missing roughly 3 solar masses—emitted in a powerful burst of gravitational waves. Imagine three of our Suns suddenly annihilating and you’ll get an idea of just how much energy we’re talking about here. Studying the amplitude told them the collision happened some 1.3 billion light years away in the southern hemisphere. So not only is this the first direct detection of gravitational waves, it’s also the first proof that binary black hole systems actually exist. And all this came from data during an engineering run right after the upgraded Advanced LIGO came online. It’s still not hunting at full sensitivity yet. When that happens, physicists expect to see many more such events, giving them a new window into how the universe works. In fact, Weinstein said that an additional 12 LIGO-related papers would be posted by the end of today. That makes LIGO “a new instrument for observing a new form of radiation come from the heavens,” said Bill Weber, a physicist at Universita di Trento and member of the LISA Pathfinder collaboration. The key difference is that while sound requires a medium through which to travel, gravitational waves move the medium—in this case, spacetime itself. 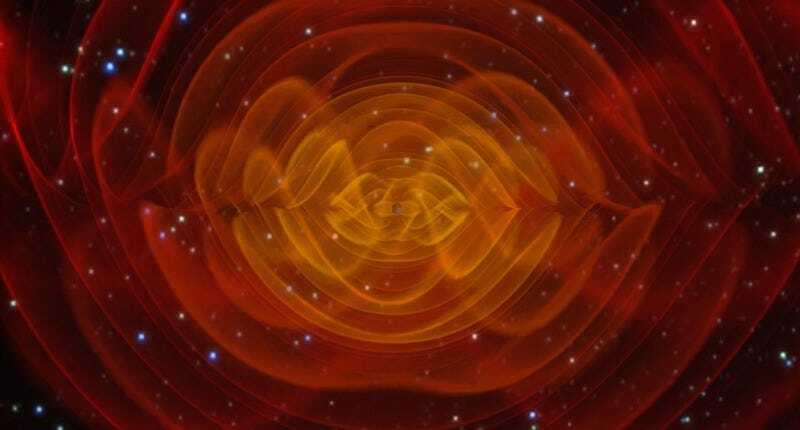 “They literally squash and stretch the fabric of spacetime,” Chiara Mingarelli, a gravitational wave astrophysicist at Caltech, told Gizmodo. To our ears, the waves detected by LIGO would sound like a chirp (“woo-OOP”). Exactly how is this revolution going to happen? Well, LIGO currently has two detectors, acting as “ears” for scientists, with more detectors slated to come online in the future. And while LIGO may have gotten there first in terms of direct detection—frankly, it was always expected to do so—it’s not the only game in town. There’s more than one kind of gravitational wave. In fact, there’s an entire spectrum, much like there are many different kinds of light, of varying wavelengths, in the electromagnetic spectrum. So there are other collaborations tailored to hunt waves at frequencies beyond what LIGO is designed to detect (the millisecond regime). Mingarelli works with the NanoGRAV (North American Nanohertz Observatory for Gravitational Waves) collaboration, part of a larger international consortium that also includes the European Pulsar Timing Array and the Parkes Pulsar Timing Array in Australia. As the name implies, NanoGRAV scientists are hunting very low frequency gravitational waves in the 1 to 10 nanohertz regime; LIGO’s sensitivity is in the kilohertz (audible) portion of the spectrum. That makes for very long wavelengths; in fact, it would take ten years to complete a single cycle. The collaboration relies on pulsar data collected by the Arecibo Observatory in Puerto Rico and the Green Bank Telescope in West Virginia. Pulsars are basically rapidly rotating neutron stars, formed when stars more massive than the Sun explode and collapse inward. They spin faster and faster as they shrink, just like a heavy weight on the end of a tether will swing faster and faster the shorter the rope becomes. They also give off powerful blasts of radiation as they rotate, just like the beam of a lighthouse, that are detected as pulses of light back on Earth. And those periodic rotations are remarkably precise—until quite recently as accurate as an atomic clock. This makes them an ideal cosmic detector of gravitational waves. In fact, the first indirect evidence came from studying pulsars in 1974, when Joseph Taylor, Jr. and Russell Hulse found that a pulsar orbiting a neutron star was slowly shrinking over time—an effect one would expect to see if it was converting part of its mass to energy in the form of gravitational waves. In the case of NanoGRAV, the smoking gun would be a kind of shimmering effect. The pulses should arrive at the same time, but if they’re hit by a gravitational wave, they will arrive slightly earlier or later, because spacetime will shrink or stretch as the wave passes through. [LISA’s] goal is simple: using laser interferometers, the spacecraft will attempt to precisely measure the relative positions of two 1.8 inch gold-platinum cubes in free fall. Housed in separate electrode boxes a mere 15 inches apart, the test objects will be shielded from the solar wind and all other external forces, such that the tiny motions caused by gravitational waves can (hopefully) be detected. Finally, there are two experiments designed to target the imprints left by primordial gravitational waves in the cosmic microwave background radiation (the afterglow of the Big Bang): BICEP2 (Background Imaging of Cosmic Extragalactic Polarization 2) and the Planck satellite mission. BICEP2 famously declared that it had found such evidence in 2014, only to have its hopes deflated when those signals turned out to be due to cosmic dust. But both collaborations are continuing the hunt, in hopes of shedding light on the early history of our universe—and hopefully providing confirmation of a key prediction of inflationary theory. This theory predicts that shortly after its birth, the universe underwent a rapid growth spurt that should have produced powerful gravitational waves, leaving an imprint in the CMB in the form of a special orientation of the light waves (polarization). Each of these four gravitational wave regimes will give astronomers four new windows into the universe. So.... you’re saying there’s chance. Make it so. Maddie Stone contributed reporting to this article.